A few weeks ago I was reviewing the contents of the Venturelab workshop Effectuation by professor Saras Sarasvathy, to see if I could apply the effectual principles for personal development. 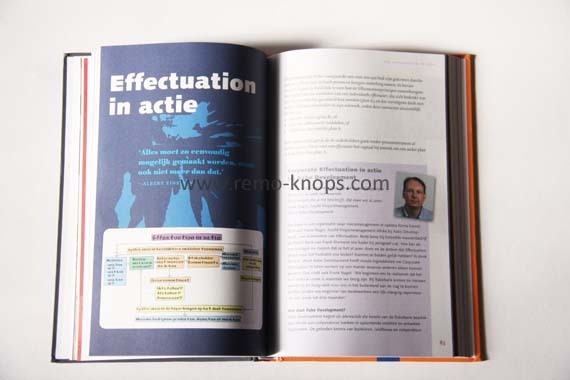 In this process I got connected via Twitter with Thomas Blekman, a part-time lecturer in Corporate Effectuation and Strategy at Rotterdam School of Management Erasmus University Rotterdam, who recently published the book Corporate Effectuation. In the article below I will write down my thoughts and experiences while reading the book. I hope it will provide a helpful overview, and invites you to read the book Corporate Effectuation (and apply its principles in everyday life). Thomas Blekman starts his book by explaining the term effectuation and the differences with causation (the leading way of thinking in management theory, which focuses on prediction and control). Pilot-in-the-plane principle: The future comes from what people do. Some time ago I reviewed The One Minute Manager — (Blanchard & Johnson, 1983) and The One Minute Sales Person – (Johnson & Wilson, 1984). In these books I particularly liked the One Minute Manager’s- and the One Minute $alesperon’s Game Plan. If you are interested in some more background reading on effectuation, than the paper Causation and Effectuation: Toward a Theoretical Shift From Economic Inevitability to Entrepreneurial Contingency, is highly recommended. The first two chapters of the book introduce the theoretical framework- and the essence of effectuation. The other seven chapters link effectuation to various other scientific approaches and like business modelling, reframing or the granularity of innovation. I will cover six of those chapters in the sections below. Thomas Blekman uses Essent as an excellent practical example to illustrate that innovation and a focus on cost reduction and process optimization can go hand in hand (if effectuation is used). Effectuation empowers the explorative power of the organization, which perfectly fits the long term strategy of adding value to propositions. Furthermore interesting to see three different levels of High Performance Organization(s), in line with sustainable change leadership types (Rowland & Higgs, 2008). A little more than a year ago I met Osterwalder and his book team, after which I wrote a preview of the book Business Model Generation. The essence of the book is the business model canvas, which consists of 9 building blocks. Camilla van den Boom from Business Models Inc. describes in this chapter the use of this canvas as flexible strategic business planning- or change management tool. She uses the case of the university hospital Maastricht, which made it highly interesting to read. Further more each of the effectual principles is applied during the process of developing a new (set of) business model(s) for the university hospital. Before reading Corporate Effectuation I didn’t knew Reframing. When you read the definition carefully it consists of a few highly interesting aspects (highlighted in bold). The focus on human behavior and the relations between people and products is an interesting approach. The focus on future products and services reminds me a little of scenario planning and future planning concepts I have heard during the vision on the future symposium some time ago. 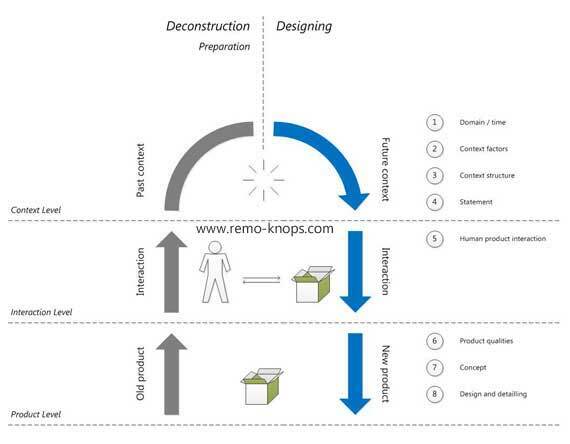 The picture above describes the reframing process, with the starting point in a current set of products (or services). Decomposing the product, man-product-interactions and the contextual aspects in the first phase. And designing the new product or service in 8 steps over the context, interaction and product levels. I will certainly dive a little more in this framework ! Back in 2008 I attended the fifth European Masterclass on Corporate Entrepeneurship & Open Innovation with Henry Chesbrough & Kenneth Morse together with a lot of people from Philips Research. During this masterclass I’ve met Corina Kuiper as one of the involved experts. Therefore it is really cool to read her chapter in the corporate effectuation book about the granularity of innovation and the innovation portfolio management within Philips. Disruptiveness to the customer determines how to innovate. 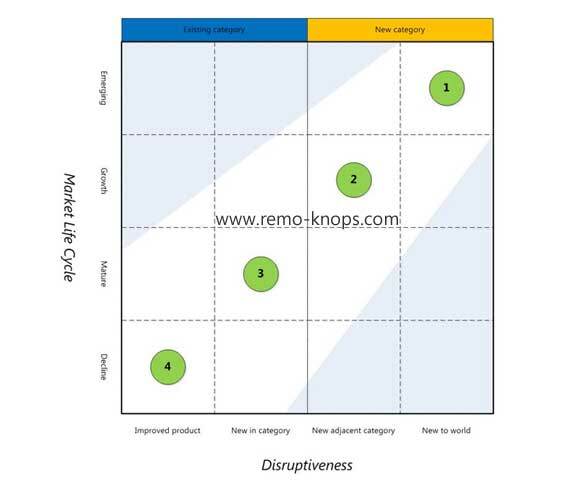 Philips has developed a 4×4 innovation matrix, with disruptiveness and market life cycle on both axis. Furthermore you can see that the left blue half of the matrix is aimed at existing (more mature) product categories, while the orange right half is aimed at new categories. On the diagonal you can furthermore see numbered green dots, that combine the different stages of market life cycle and disruptivess. In fact you move from radical innovations in the upper right corner to incremental innovations in the bottom left corner. Almost every company has these four types of (innovation) projects, where probably most of the projects are in the adult stage. A baby is an radical innovation project for the long term in a very early stage. Management teams foster both adults and babies. According to research large firms have problems with managing adolecents, because there are tensions with for example the current business model, current supply chains or first customers. 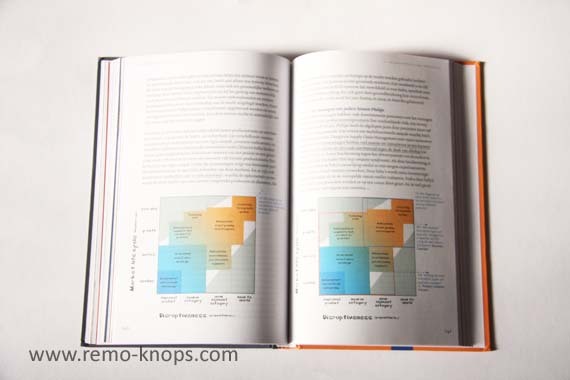 Philips uses the innovation matrix (and specific area’s like you can see in the picture of the book above) to visualize the different types of innovation (and the resulting specific approach). Boxed budgets, incubators, balanced scorecards for ventures and the stage-gated Bell Mason Group framework for new business creation are specific tools that support the various types of innovations. Additional recommended reading is the slidedeck The flavors in corporate innovation by Fred van Ommen and Corina Kuiper for the Corporate Venturing Conference 2011. Effectuation in a personal development setting, was the primary driver to review the scientific effectual framework and got me connected with Thomas Blekman. 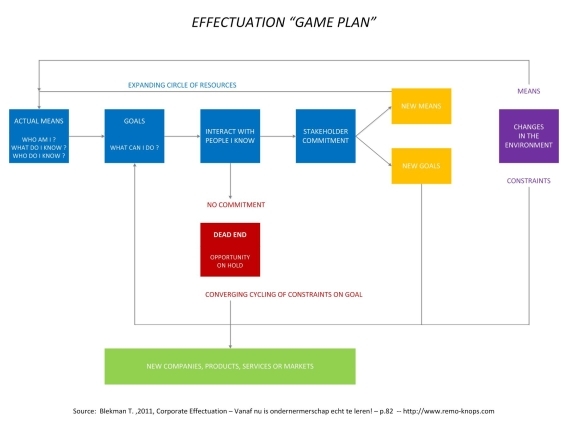 Michael Faschingbauer has written the book “Effectuation, Wie erfolgreiche Unternehmer denken, entscheiden und handlen.” (Effectuation, How successful entrepreneurs think, decide and act.) It has been the management book of the year in 2010. Faschingbauer provides a few very helpfull tips, complemented with tips from Thomas Blekman. Despite the highly interesting tips, I will try to get my hands on the book of Faschingbauer, and go a few steps deeper into the personal development aspects of effectuation. While it really depends on the organization which of the “parts” are applicable and which set of the organizational parts has the highest impact. I was interested in the combination of IT systems and the Corporate Effectuation mindset. IT systems can provide the latest information, latest views, latest research or even ideas that help employees with driving innovation and absorbing new knowledge. Furthermore you could think about the use of knowledge management platforms combining the brain-power in a company, or the use of business intelligence solutions that help to make informed decisions. Thomas Blekman and Henri Mennens provide an approach to integrate the Corporate Effectuation mindset into a company. The Corporate Effectuation Business Program is a seven-step process that combines different tools that are covered before in the book like business modelling and reframing. I got connected with Thomas Blekman via social technology (thank you Charlene Li) while in our meetup he explained his background and drivers to write the book ! The Corporate Effectuation book first builds the foundation with effectual principles in the first two chapters and connects with other scientific frameworks and management theories in the other chapters. Corporate Effectuation consists of a bulk load of highly interesting examples that help building understanding of the Effectual principles in various settings and situations. The look and feel of the book shows similarities with the Business Model Generation handbook (Osterwalder et al. 2010). Overall it is fun to read and remark the post-it on the front cover: “Irritant goed boek !” That is what the Corporate Effectuation book is, a must read for every entrepreneur, manager or professional. 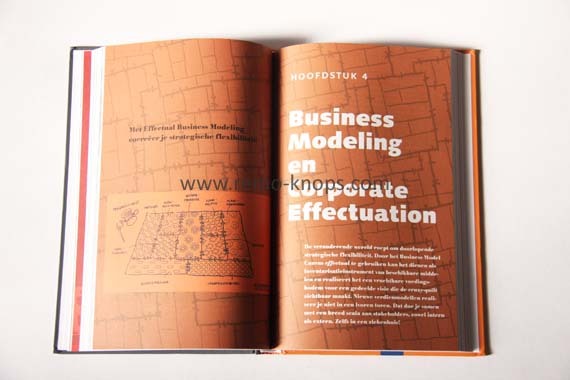 Corporate Effectuation is available in Dutch and English. Thomas Blekman is a part-time lecturer in Corporate Effectuation and Strategy at Rotterdam School of Management Erasmus University Rotterdam. He has recently finished his new book Corporate Effectuation. Corporate Effectuation is the very first work in The Netherlands about this new and very successful approach. 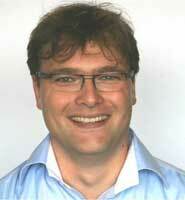 Thomas Blekman is partner of De Beukelaar Group, dean of Corsendonk College in Belgium. In other words, he is with one foot firmly in daily practice, while footing the other on solid science; in short, the living proof of Effectuation! Thomas has extensive experience in the corporate field and is specialized in consulting and facilitating firms becoming more innovative and entrepreneurial. In Thomas’ opinion scietific knowledge is only relevant if it has practical value. 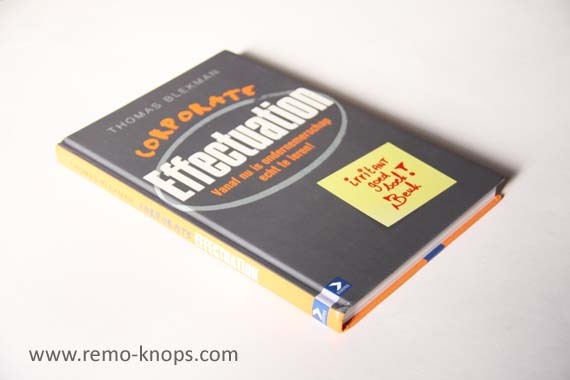 Hey!, I found this information for you: "Corporate Effectuation Book Review (Thomas Blekman)". Here is the website link: https://www.remo-knops.com/book-review/corporate-effectuation-blekman/. Thank you.